Compared with the air quality monitoring methods of even a few years ago, today’s air monitor system offers its users a quicker, more effective, and comprehensive way to assess potential environmental hazards. 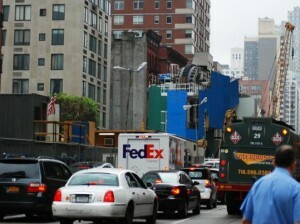 2nd Ave Subway Construction Muck House - What emissions from here are impacting the Local Air Quality? The recently published article, “ MTA: 2nd Avenue Subway Construction Not a Danger to Your Health,” responds to a rise in complaints about possible environmental health hazards from the construction. In the article, MTA Capital Construction President Michael Horodniceanu suggested the public faced no danger from the construction based on results from a fall 2011 Parsons Brinkerhoff (PB) air monitoring study. The PB study highlights important facts and issues about the project and makes useful points about air quality monitoring in general; however, PB used the same traditional dust and vapor monitors and methods that were used at the World Trade Center recovery site in 2001. In the last decade and especially over the last few years, superior air monitoring technologies have been developed and used to help ensure that emission rates from major hazardous waste remediation operations in the New York metropolitan area are kept as low as possible. The use of innovative, more effective, and more cost-saving air monitoring equipment and methods would have provided data for the PB study that would better support MTA’s assertions. For example, state-of-the-art air quality monitors today use integrated, real-time environmental air sampling that measures multiple dust particle sizes while simultaneously tagging each sample to wind speed and direction—a particularly valuable approach for evaluating the impact of blasting, material (rock) loading, vehicle exhaust emissions, and other construction-related activities in densely populated urban sites where wind direction varies significantly. In addition, vapor and gas measurements, including VOCs, SO2, CO, H2S, and NH3, can now be integrated into a single database to create a visual map of the air quality and wind direction across a project area. The data are then transmitted in real time to computers, including iPads and other handheld technology, for quick response to problems. Given the options, PB and the MTA would have found these and other meaningful enhancements in air monitoring equipment and techniques valuable to the 2nd Avenue Subway construction project. I encourage you to learn more about state-of-the-art air monitoring equipment, including integrated systems that allow users to make evidence-based decisions to protect workers and the public.